Our clients are our best advertising. Your satisfaction is our goal. Throughout the process, we provide you with the best products, at a fair price, delivered in a reasonable time frame. Our dedication doesn’t end there. Ask our clients about their experience with Aqua Blue Designs, Inc. Here are a few testimonials. We’re happy to make arrangements with prior clients if you’d like to speak to with one of them directly about their experience. Our family had been thinking of installing a pool for sometime. We had all but settled on a lined pool like many in our neighborhood when we came across Norm's site, Aqua Blue Designs. We reached out to Norm to discuss the benefits of going with a fiberglass pool versus a lined pool. Norm graciously came to our home and sat down to explain his philosophy on pool building and the benefits of a fiberglass pool. I was immediately taken in by his district passion for building. I asked if it would be possible to see some of his work and without hesitating he said absolutely. We spent a day driving to various pools that he had installed over the past year. Most were already completed and one was in the final stages. I was truly impressed with the work that had been done and felt confident we had found the right person for our project. Norm and his crew built us our dream pool. I was very impressed with the crew and the respect they had for our home during the install process. All were very considerate and went out of their way to explain the project as it developed. Without a doubt Aqua Blue Designs was the right choice for us. When our family decided to purchase a swimming pool, the next question that followed was what type of pool would best fit our needs. For six months, I visited with people who owned pools, along with talking to various pool representatives. My main purpose in talking to pool owners was find out what they liked and disliked anout features in the type of pool they purchased and their satisfaction with the company that serviced their pool. I saw many pool owners spending an inordinate amount of time, many hours a day, cleaning, testing water, balancing chemicals, etc. 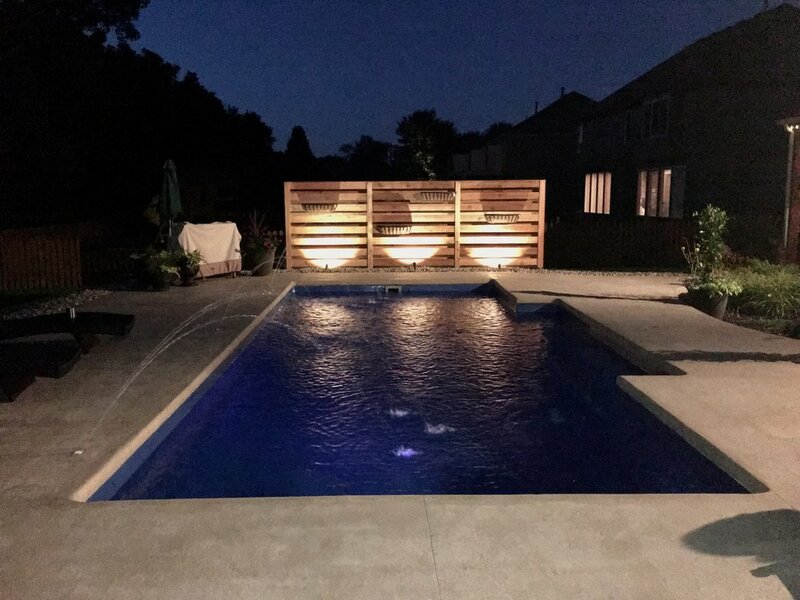 As I finished investigating what I considered to be the highest quality pool with the least amount of maintenance, it was very evident that the fiberglass pool was the best product for the money. Next, I needed to find a reputable company that would do what they said, standing behind their product and workmanship. I found that company with a local owner who takes pride in a quality finished product. And, one year later, I can say it was the best decision to go with Aqua Blue Designs. Not only is the pool of high quality, but it met my highest priority in selecting a pool, that of minimal time to maintain. Even though all four of our children indicated they would help in pool maintenance, I knew over time it would ultimately fall to me in maintaining the pool. Lastly, I cannot say enough about Norm as the owner of Aqua Blue Designs. Not only is he a person of high integrity, but he is committed to making certain that what is indicated will be done is completed to all agreements and satisfaction. Even more important to the sale and installation of the pool is the follow up. He continued to contact me so as to be certain everything is functioning properly and asks if there is anything that can be done to improve service. Norm's business is not based on a single sale but a commitment to an ongoing, satisfied relationship. With an honest, open opinion I highly recommend Aqua Blue Designs and what it represents in the pool industry. I enjoyed another fantastic year working with you! Let's look at what you have done for us: Play System at Wyandot County Lake, took out some old junk and replaced with new concrete sidewalk, new below-grade drains, and a new berm. Not a drop of water sits anywhere near these new drains. Great job! Parkwood Pool spray park Feature added a new spray feature to a 40 year old system that has made the kids pool so much more usable and is always full. So much fun to watch the kids. Capital Federal at Sandstone resurfaced a 40 year old stage and repaired several concrete wing walls, what a job. And all with spring rains and an unbelievable schedule. Pierson Spray Park, you saw an underground mechanical room full of water that had ruined all the pumps, filters, chemical feeds, and computers and designed a new above ground building that improved the filtration by over 300%.You were able to work within a very tight budget with no change orders. Your diligence of working through the rains, tornados and no power was so appreciated. But that just shows your commitment to do a good job! I am hoping we will be able to work together on many future projects. When I need a job done, I can always count on you. Thanks again for a fantastic year!